The Minister of Labour and Employment, Chris Ngige will lead the federal government team, including the Ministers of Finance and that of the National Budget and Planning to a crucial meeting today with the Nigerian Labour Congress (NLC), Trade Union Congress (TUC) and other labour unions, as part of his efforts to avert the planned industrial action by the labour over the delay in the implementation of the recommended new minimum wage. The federal government negotiating team will also hold another round of discussions with the leadership of the Academic Staff Union of Universities (ASUU) in a bid to resolve their differences and reopen the country’s public tertiary institutions that have been shut down in the past one month. The issue in contention between the federal government and the organised labour movement is the N30,000 new national minimum wage, which the organised labour is demanding that the bill be forwarded to the National Assembly for enactment. Instead of forwarding the bill, the federal government had said it would subject the report of the tripartite committee on minimum wage to a further scrutiny by a technical committee. On its part, the organised labour had reacted to what it described as undue delay tactics by the federal government, threatening to embark on nationwide protest beginning from Tuesday. A meeting was recently held between the government team and with the labour movement, represented by the NLC and TUC but it ended inconclusive. Addressing journalists at the end of the meeting last Friday, Ngige said the issues were not conclusively dealt with. He said although significant progress has been made in getting labour to understand the position of the government, there was the need for another round of talks today to agree on the period for the transmission of the National Minimum Wage Bill to the legislature. “No, the meeting is not deadlocked, we are continuing on Monday (today). We have made substantial progress in our talks with labour in terms of the transmission of the New National Minimum Wage Bill to the National Assembly,” Ngige said. Also speaking on the outcome of the meeting, the NLC President, Ayuba Wabba, said the meeting was inconclusive as there were still some physical issues that needed to be concluded when they reconvene today. He said the issue at stake is to make sure that the minimum wage bill is transmitted, including other auxiliary issues that government said they were trying to put together. In the case of ASUU, the union is currently on an industrial action, which has stretched for over one month. ASUU had on November 4, 2018, embarked on nationwide strike over unfulfilled past agreements by the federal government. Since the lecturers downed tools, several meetings have ended in deadlock, with the President of ASUU, Prof. Biodun Ogunyemi, and other leaders of the union insist that the federal government must fulfil agreements reached with the union in 2009, 2013 and 2017. 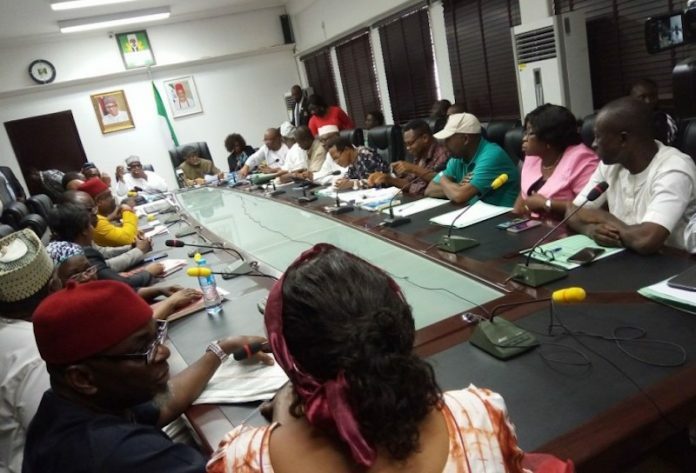 The last meeting between the federal government team and the ASUU delegation ended in a deadlock, with the lecturers expressing dissatisfaction.